We each have our own reasons for holding on to stuff, clutter, negative emotions, and other things. Usually though, all of our excuses, fears, and resistance come back to a few common struggles. One of those struggles is guilt. It was an issue for me, and based on our conversations, I think it may bother you too. I remember feeling guilt when I looked in my closet and saw clothes I never wore purchased with money I didn’t have. I felt guilt when I said no to people, or even when I thought about saying no. There was the guilt about gifts. I felt bad about letting go of things other people gave me. I felt guilty about overdue credit card bills and collection calls, for shopping to feel better, for feeling less than enough because I didn’t own the right things, or have the right car/shoes/kitchen … and the list goes on and on. I even felt guilty for rejecting all the things I thought I always wanted. This guilt wasn’t all consuming, but it surfaced more when I made the decision to start slowing down and letting go. I finally had the time and space to feel all the feelings. If you feel guilty every time you open your closet and see an expensive dress hanging with the tags still on, or a pair of shoes that give you blisters, own it. Write it down. That flash of guilt you may experience on a daily basis has become so consistent, it feels normal. I used to think I was supposed to feel guilty. After all, with all the mistakes I made, shouldn’t a bit of guilt go along with them? What I didn’t know is that the guilt was weighing me down with absolutely no purpose. The guilt wasn’t serving me in any way. When I recognized that guilt had become an anchor, instead of inspiring something better, it was easier to let it go. In my experience the biggest gift of gifts is in the exchange. It’s in the “I’m thinking of you.” or the “I love you.” and not what’s contained in the gift box. Is there really any “thing” someone could give you to prove their love? It doesn’t happen like that. Love isn’t a one time gift. It doesn’t arrive wrapped perfectly, and you never have to prove it. Letting it flow doesn’t just apply to gifts. 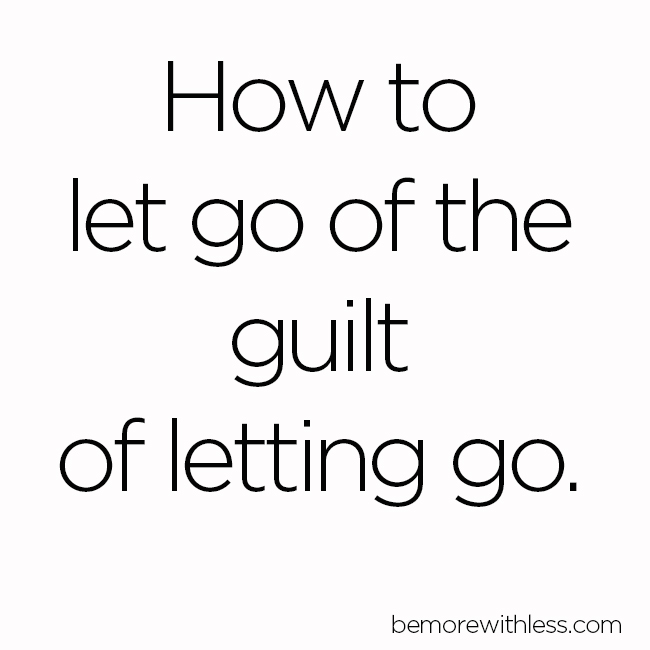 When you let go of anything in your life that doesn’t add value, let the guilt flow with it. Here are a few solutions to simplicity related guilty situations you may be experiencing. Guilt about letting go of a sentimental item: Try a victory lap. Closet chaos guilt: Clean out your closet for good. Guilt around relationships and boundaries, especially when you are telling yourself stories about what other people are thinking: This! This! This! Guilt about not doing enough: Measure more by what’s in your heart, and less by what’s on your to-do list. When you say yes, because you feel too guilty saying no: learn how to say “no” to everything ever. Guilt about spending too much: Stop shopping for a while. When you feel guilty about your home not being perfect: Invite your friends over. If you feel guilty about being too busy for people you love: End busyness. When your messy past causes guilt: Remember the blessings of a messy life. The best way to let go of the guilt of letting go is to let joy replace the guilt. Let love replace the guilt. 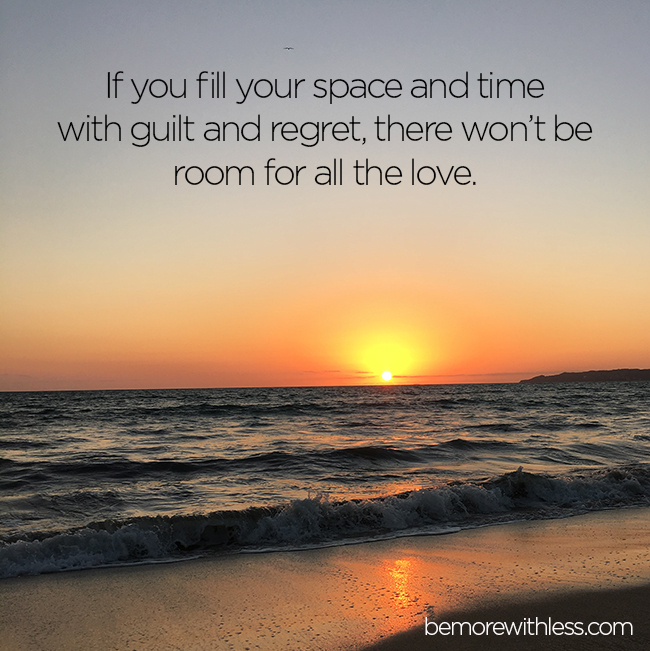 Remind yourself that you simply don’t have room in your life for guilt. The guilt of letting go doesn’t come from letting go. When stuff becomes a constant reminder of debt or discontent, we feel bad, sad, and guilty. When I look back, I can clearly see that guilt was just as much a part of my clutter as the things hanging in my closet or stuff in my junk drawers. I also know that the guilt and the stuff were deeply connected and when I let go of the stuff, the guilt went with it. What’s interesting about the guilt of letting go, is the guilt doesn’t usually come from letting go. It comes from holding on. When guilt is attached to holding on, the only remedy is to let go. I could continue to feel guilt about past mistakes, about my past debt, clutter, and busyness. Instead, I’ve let it go so I can live today with purpose and joy. I continue to create more space and time in my life, but if I fill it all with guilt and regret, there won’t be room for all the love. Thank you, thank you, thank you for this very timely post! I’ve been a big fan of your blog for about a year and have greatly enjoyed making my way through the archives. I’m dressing with less and recently let go of 400 items (I counted), and I feel lighter and more energized than I have in years! I’ve cut back on commitments and have found a balance in my work and home that I love. Despite all of these benefits, I’ve still noticed a sense of dis-ease in my body – catching every cold that floats around and feeling generally tired and blah over the past few months. Just today, I sat down for a chat with my husband and realized that what remains is the guilt. If I don’t work enough, give enough, say yes enough…for many of us, at the core of that statement, what follows is, “…then I am not enough.” I couldn’t believe it when I pulled up your website and saw this post today, echoing exactly what I was thinking. Time to release the guilt. Thank you for the time, energy, and TLC that you put into your writing. I needed to read this today! I’m feeling guilty because a friend wants a girls night out dinner but I just want to avoid costly dinners out while I’m paying off a big debt. I suggested getting together in April but for a walk instead. She hasn’t responded yet. I know she enjoys dining out but she also makes twice the money I make and its just not a priority for me right now. I’m hoping I’m not going to feel guilted into going out to a restaurant. I’m trying to stay strong. Go for coffee? It’s still “out” but much cheaper than a meal. Guilt’s such an energy drainer, a big wet blanket that immobilizes us and keeps us from forging ahead. Spotting its ugly tentacles is a needed first step. Now … to let it go and move on with all that’s waiting for us to claim! Great post, Courtney. I used to think it was weird that I felt guilt about not feeling guilty of saying no or letting something go. I’m glad I’m not the only one who struggles with that. I really liked you’re third point where you talked about letting the gift flow out. It’s good to acknowledge it and not ignore it. After that, we need to let it go with our no or with the stuff we’re getting rid of. Thank you very much for this well written post, Courtney! Indeed, guilt burns a lot of energy we could use in more appropriate ways and for the change for the better. But it has also a “good” effect when we can clearly see, what is / was wrong and then make improvements or change direction. The point is, not to cling to it and you stated it splendidly. I also deal with some items, I was given by dear friends (books with dedication I no longer want to own) and your post levels out the way to let them go (the books, not the friends, of course). When I make a gift, I accustomed myself to tell the presentee to let the gift go in case it is undesired or doesn’t bring joy anymore. This also forces me to think more about what to give. Most people now know not to buy me a gift that is not an experience. The children get gift vouchers for a facial for example. My husband and I get concert tickets instead of physical items. I’ve just managed to get a cook with a Master Chef winner for this weekend, for free, it’s our anniversary weekend, and my birthday. I really do not want any more stuff coming into the house. Anticipating others making us, or trying to make us feel guilty. We are planning a big trip and my mother in law is terminally ill. No one knows how long she will live, one day, one week,one month, one year, ten years. The trip has been known about for over a year. We have decided that taking the trip won’t change the outcome. We visit often, she’s well cared for in a comfortable, safe environment. Speaking to non relatives, one a minister the other and woman of the same age as the mil, both said, you can’t put your own life on hold. Yet we know we will be judged by those who think that we must ‘ do the right thing’ and will live with it. It’s them projecting guilt on to us. Whatever we do we cannot change the outcome. We have de cluttered and downsized to change our life to a more simple one with more travel and less cleaning. And so we will. I would like to address a different kind of guilt, a kind I just don’t know how to deal with. I feel guilty when I want to buy something. I have read so much about minimalism and would also like to be more conscious of the environment, that it just feels bad. Even so, the other half of me wants things with a passion. And I am not talking impuls buys either. An example, we have a bare electricity thingy in the living room and no lamp for it, we have been living here for over a year and I started looking online for a second-hand chandelier. Second-hand is always tricky because there is only 1 of everything. And I found two that I like. More of our lamp things (sorry not a native speaker 🙂 ) are quite ugly, so I might buy two and then let go of the old lamp. But everytime I (want to) buy something, I keep switching between joy and guilt. And in the end, I always feel bad that I bought something! Buying a thing is not only not fun, it makes me feel bad and doubtful and ashamed. Sorry for the long text! Does anybody else feel guilty for buying? How should I deal with this? I’m pretty ruthless about letting go of stuff. The only time I struggle is if the item is either sentimental or expensive. Even then, I find ways to overcome my reluctance. For me it’s less guilt than it is want. For me the guilt comes in saying no to people (ex who want me to work for free), or in setting other healthy boundaries. I do it but then wrestle with the emotion of guilt and am learning that I am not ‘selfish or bad’ for saying no.